The CES International Consumer Electronics Show, known as the "Oscar Festival in Science and Technology Circle", exhibit during January 8th - 11st 2019, in Las Vegas, USA. As the global largest consumer electronics technology exhibition with the broadest influence, CES is a show for the mass appearance of new products and black technologies, attracting the attention from numerous media and audience. Snail Sleep APP, as a leading brand of sleep health, has been focusing on sleep monitoring and improvement since established in 2014. The product has won the favor of consumers and experts. At CES, Snail Sleep provides customers with diversified choices for high quality sleeping products. The combination of Smart Health Solutions and technological innovations attracts more attention of visitors. The exhibition booth number of Snail Sleep：#43317，Las Vegas Sands Hall. 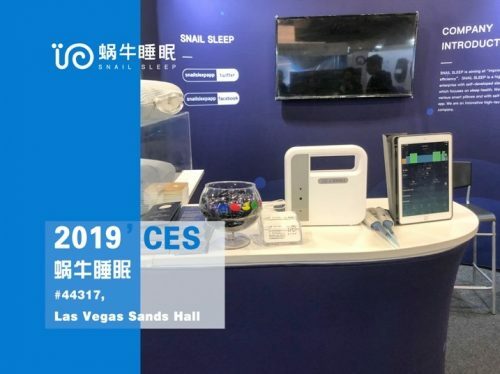 On the CES 2019, Smart Home has occupied a large part of the market, and in the field of sleep tech, the most surprising is the S2 Lite of Snail Sleep. Different from the other sleep intelligent monitor, which is deft, not limited to a specific bed or pillow. The S2 Lite can be worn on any pillow, bedsides, even on business, travel, can be easily carried with, which can always record and analyze sleep quality of users. Snail Sleep and its partner Erki jointly launched a sleep regulator - ERKI G3 intelligent sleep regulator that integrates auditory, visual, scent, which combined full sensory with time biorhythm (Functional odor of small molecule, intelligent light, full-frequency range background sound), can really wake users up through the internal sleeping and waking processes of the brain. Through the scientific sleep algorithm, the corresponding sleep signal is released and reshaped the user's sleep rhythm, and the quality of user's sleep is safely improved. At the same time, with the Australian laboratory special patented sleep aid and wake-up essential oil, the fragrance of sleep aid oil can help users to have a high quality sleep, and the wake-up essential oils can help users wake up naturally. In addition, there is a matching App tracking users' sleep status and quality, which can also record snoring and dream talk every night. The app has a special algorithm and keeps machine learning, which can more intuitively provide feedback and suggestions to help users optimize their sleep experience. Sleep talking made the mysterious night interesting, and made dreams extraordinarily interesting.